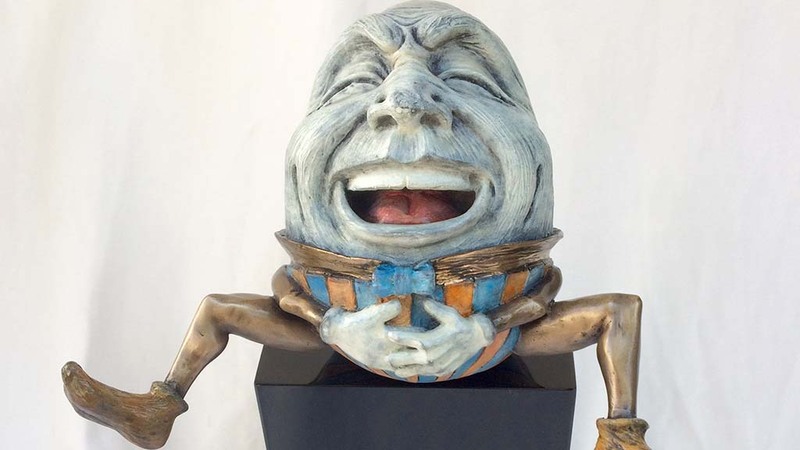 The mysterious case of the stolen “Humpty Dumpty” has been cracked. Artist Paul Lotz said Wednesday that the honorable mention sculpture stolen June 23 from a Fine Arts Exhibit shelf at the San Diego County Fair has been found. The 15-20-pound statue that received an honorable mention was perched on a display case shelf in the grandstand area when it disappeared between 9:30 and 10 p.m.
“It renewed my faith in people that it was returned,” the University Heights resident told Channel 8 this afternoon. “Whoever did take it, I don’t know, so shame on you, but he came back, so I am happy,” Lotz continued. She noted again that surveillance footage had not shown a suspect. “I think [the camera] was at the wrong angle or something,” she said. But she was excited about the artwork, worth thousands of dollars, being returned to its owner. Another of his pieces — “Counting Sheep,” a bronze sculpture of a moon with sleeping sheep — was awarded Best of Show.